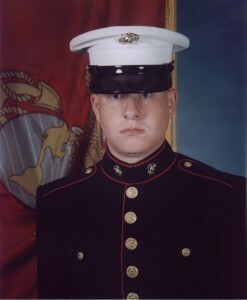 Marine Corps Sergeant Jeremy R. McQueary of Columbus, Indiana was a motor vehicle operator assigned to 2nd Combat Engineer Battalion, 2nd Marine Division, II Marine Expeditionary Force, Camp Lejeune, North Carolina. He was a seasoned veteran having served two tours to Iraq in 2005 and 2008, prior to his service in Afghanistan which began in late 2009. On February 18, 2010, SGT McQueary was killed while supporting combat operations in Helmand Province, Afghanistan. He was 27 years old. In the wake of 9/11, Jeremy McQueary finished high school a semester early to serve his country and joined the Marine Corps at the age of 18. After meeting as teenagers, SGT McQueary and his wife were married in 2004. They made Nashville, Indiana their home when not on base at Camp Lejeune, North Carolina. Later, in 2009 the couple welcomed a son to their family. An avid outdoorsman, SGT McQueary enjoyed fishing, camping, and four-wheeling. His military decorations include the Purple Heart, Navy and Marine Corps Achievement Medal, Navy and Marine Corps Commendation Medal with V for Valor along with many others. SGT McQueary’s son is a Folds of Honor scholarship recipient.